We arrived in Rabat, and got to our hotel in the medina with minimal confusion. 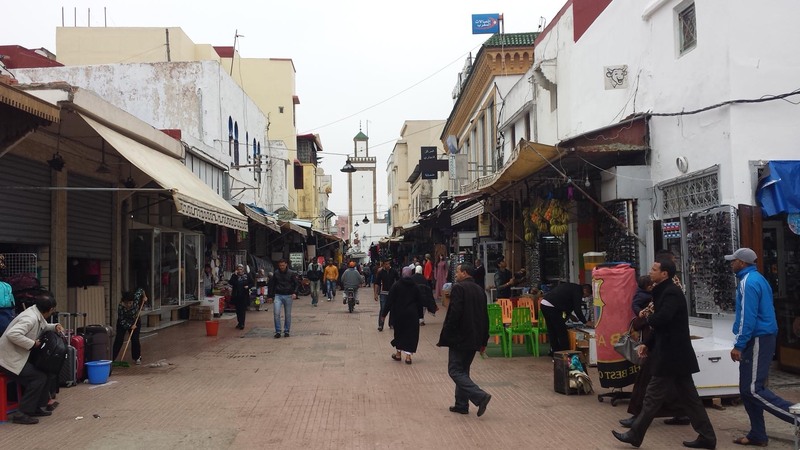 The Rabat medina is more spacious than others we’ve seen in Essaouira, Agadir and Marrakesh. As in the others, no cars are allowed, though motorbikes race through. When we arrived at the walls of the medina, we called our hotel and our host Benoit emerged to meet us. It takes some getting used to that you can park on the street and a random person will make sure your car is ok, yet that seems to be the way it works. Our luggage was put in an overgrown garden cart. Off we went on foot to the Riad Dar Soufa. The door to the house is down an alley, and Benoit lamented that city workers had just dug up the entrance to the alley and refilled it hastily–he has no idea when they will return to finish the job. The inside of the riad is nothing like the street. Once we went for a walk, I found that there is a place in Rabat that provides a vision of Morocco corresponding to my imagination. 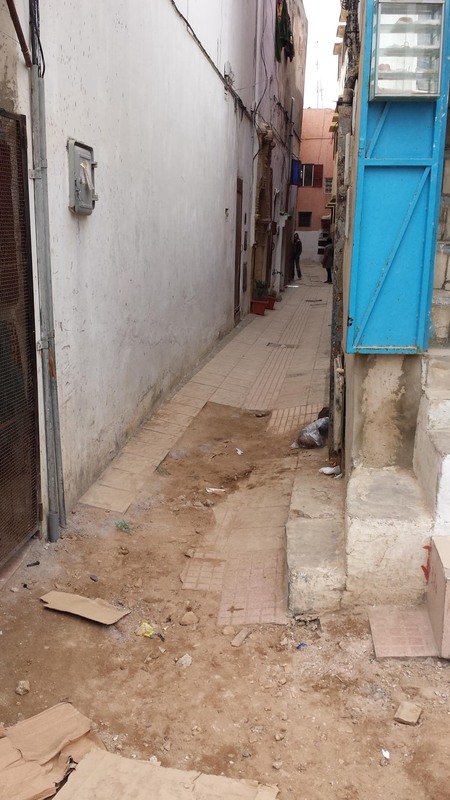 The Rabat kasbah has a community atmosphere. Plenty of families still live in this very small neighborhood. It has not all been converted to hotels. 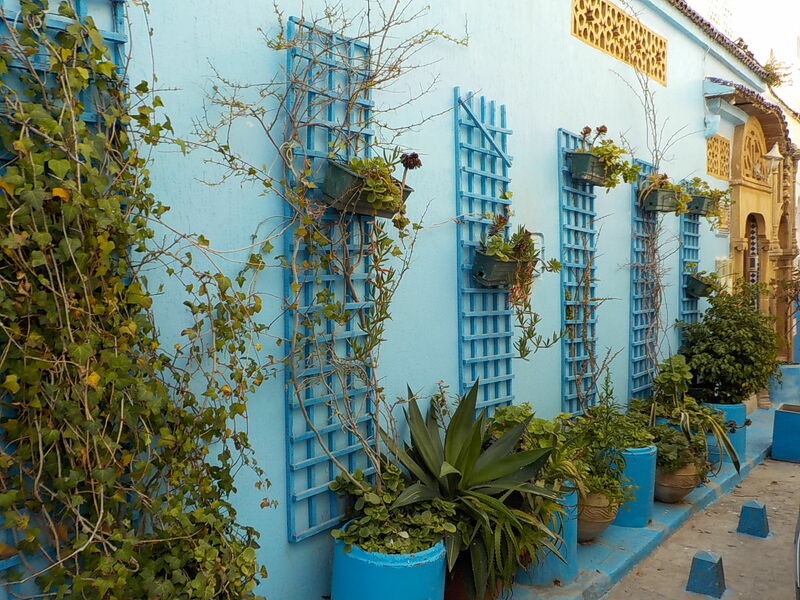 The Cafe Maure is tucked into the far side of the kasbah in a small park called the Andalusian Gardens, where the wall loops out on the riverbank and you can sip tea or coffee and look across to the rest of the neighborhood, or down the estuary to the sea. It’s a bit tricky to find the entrance, you have to enter the gardens despite the low reviews on TripAdvisor….and then you see the entrance to the terrace and cafe. I went to the Andalusian Garden expecting to see a display of traditional Moroccan jewelry that was part of the Palace museum, until it closed. Sadly, the exhibit at the gardens is now closed as well, and there is no information about what has become of the palace collections. The cafe was a consolation prize. Back at Riad Dar Soufa we admired the elaborate restored woodwork, stone and carved plaster and mosaic tile that shows off Moroccan craftsmanship. We are in the zellij room, which refers to the detailed tile in a patterned mosaic along the walls. It is unusual to have so much preserved/restored. Older houses with such detail that fall into disrepair are not always repaired and the tile either falls down or is covered with paint and plaster. 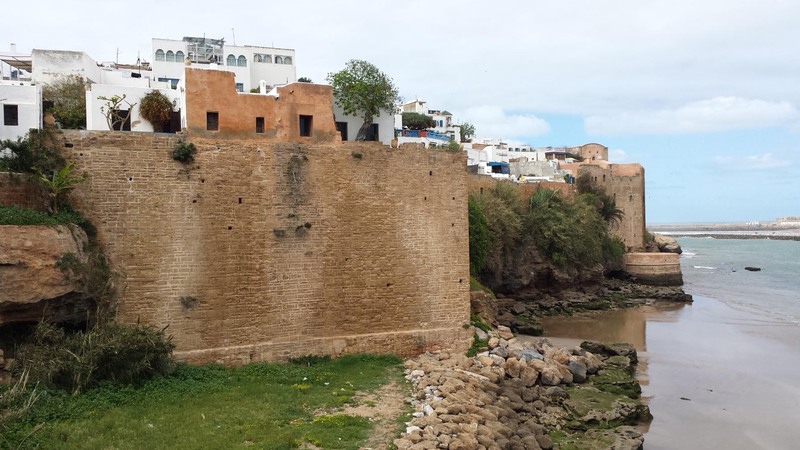 It’s not easy to find out about the history of Rabat. See my next post to find out more. The next day we rambled in the medina in the late afternoon when it was full of shoppers. 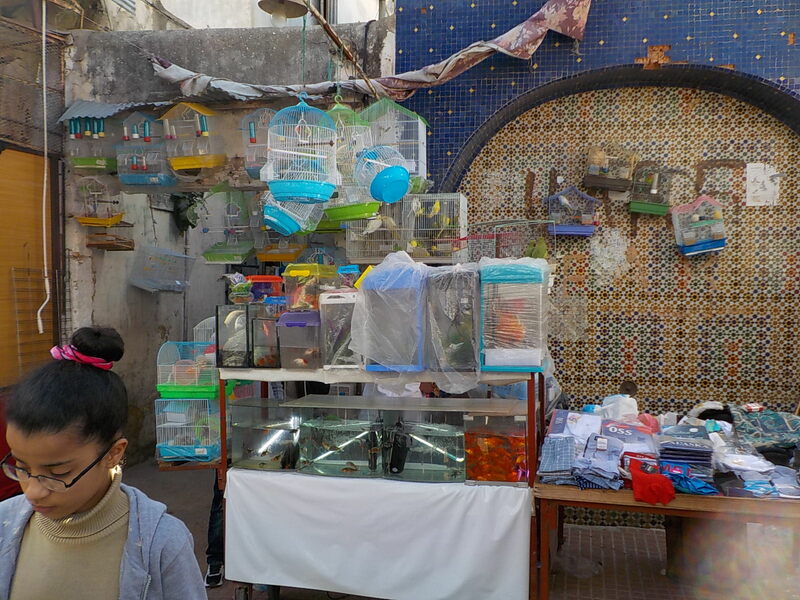 I noticed more sellers of birds (and turtles!) 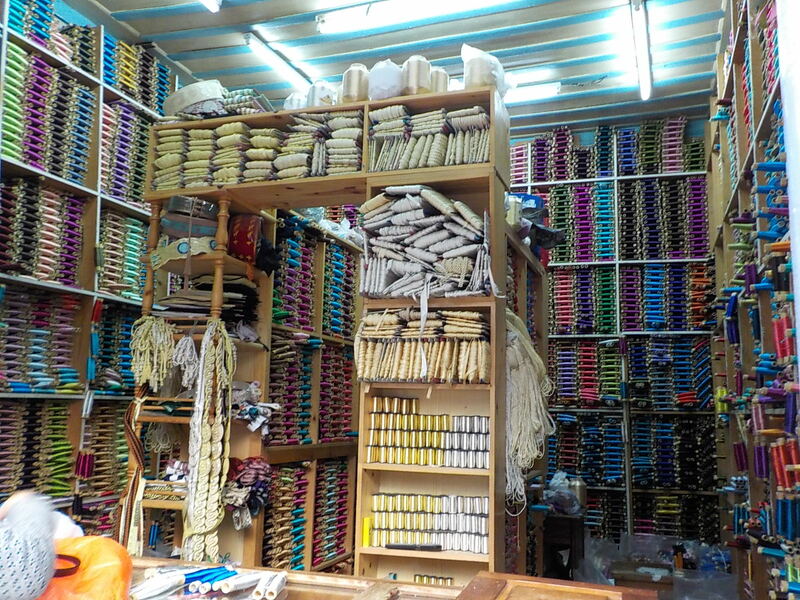 than I’ve seen before in Morocco, and I was impressed by the colorful thread and embroidery sellers. 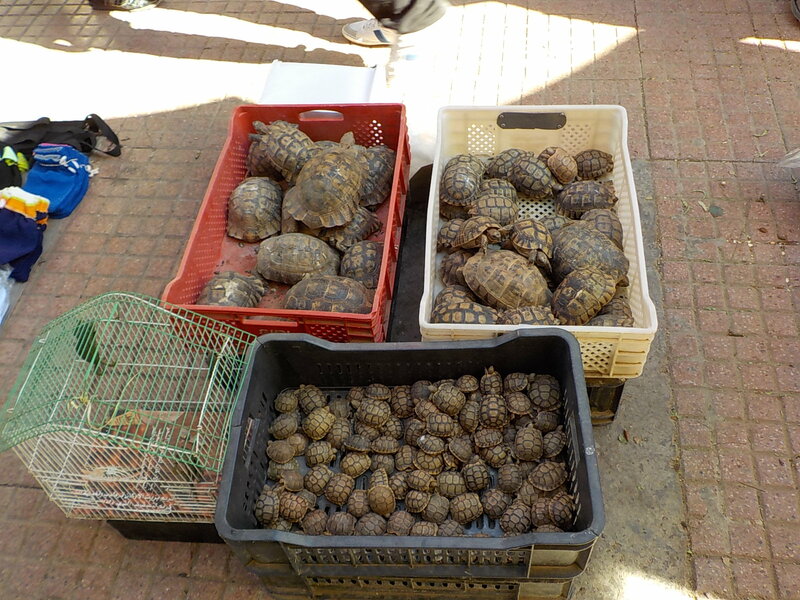 Poor turtles! I hope these are pets and not dinner. More about Rabat to come!